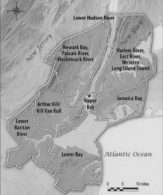 NY/NJ Baykeeper (Baykeeper) and Rutgers University examined the effects of reintroducing oysters in the Hudson-Raritan Estuary (HRE) in Keyport Harbor. Eastern oyster reefs were once common in the HRE but were driven to extinction in the region due to human activities. Water quality in the HRE has improved since the extinction of oysters in the estuary. In 2009, the Army Corp of Engineers called for the reestablishment of 500 acres of oyster reef by 2015. The primary goal of this research was to determine whether oyster populations can survive in the estuary under existing conditions. Baykeeper placed 50,000 oysters in research plot in the HRE in 2009. Researchers monitored oyster growth and survival, and the biodiversity and sediment levels of each research plot. Plots with oysters showed greater levels of biodiversity than empty plots, although the biodiversity of empty plots increased after oyster removal. After 11 months in Keyport Harbor oyster survival rates were relatively high, indicating that oyster populations could be established in some areas of the Raritan Bay. The research project ended after the New Jersey Department of Environmental Protection rescinded the research permit because of a state ban on oyster restoration. Oyster research is still permitted on the New York side of the HRE. Click on the link to read the full research article: Eastern Oysters (Crassotrea virginica) in the Hudson-Raritan Estuary: Restoration Research and Shellfishery Policy.